I am attending the Gallup Strengths Summit in Omaha for the next couple days. It is the first gathering of trained Gallup Strengths coaches, with coaches coming from all around the world. To spend time with people who have a similar passion for helping others unlock the potential of the gifts and talents that God has given them is truly a blessing. Years ago, when I began working with the StrengthsFinder assessment in my parish, the primary goal was never to get more people to do more stuff for the church. It was always to help people uncover the unique and wonderful person that God created, or as Matthew Kelly might say, to become the best version of themselves. I believe that the Church has a responsibility to help people realize their gifts and talents, and then subsequently, their God-given potential. A fruit of these efforts is that a parish can easily become more vibrant with more people sharing the load and giving off themselves freely. But at the end of the day, understanding your giftedness is a pathway to a stronger relationship with your Creator, and that really is the MAIN THING. In your parish, church, or house of worship, do you have a process by which people can uncover their gifts? So many people want to give of themselves, but they are not always aware of what they have to give. If those in your communities and congregations can’t find out about their unique gifts and talents in your hands, where else can they go? Why should they go anywhere else? 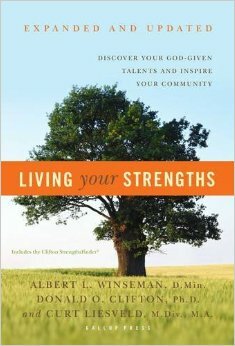 If you need advice or help starting a strengths ministry in your faith community, feel free to contact me. I would love to help. I have enjoyed reading your blog with its strong Christian ethos. I wonder if you might be interested in reading my fictional and utterly impractical plan to solve all of the world’s problems.